This Canal with Reflections tapestry shows a gorgeous scene of Venice and life on the waterways. Made of hundreds of islands interconnected with briges, Venice is a place which has a unique charm. Here we see wonderful details in the buildings, as well as the reflections on the waterways. The colors are superb as the warms tones of the buildings in reds, oranges, and peaches contrast with the cooler greens and blues. 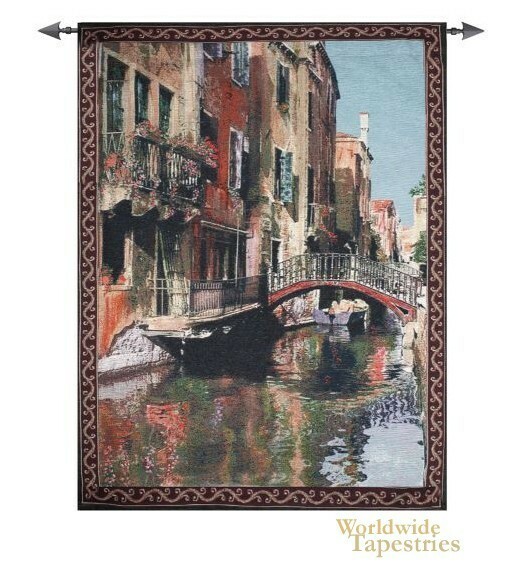 This Canal with Reflections tapestry is backed with a lining and has a tunnel for easy hanging. Note: tapestry rod, where pictured, is not included in the price.